Cell types in brain cortex. Artwork of various types of cells found in the cortex of the human brain. The cerebral cortex is the outer layer of the brain, playing a key role in memory, attention, perceptual awareness, thought, language, and consciousness. 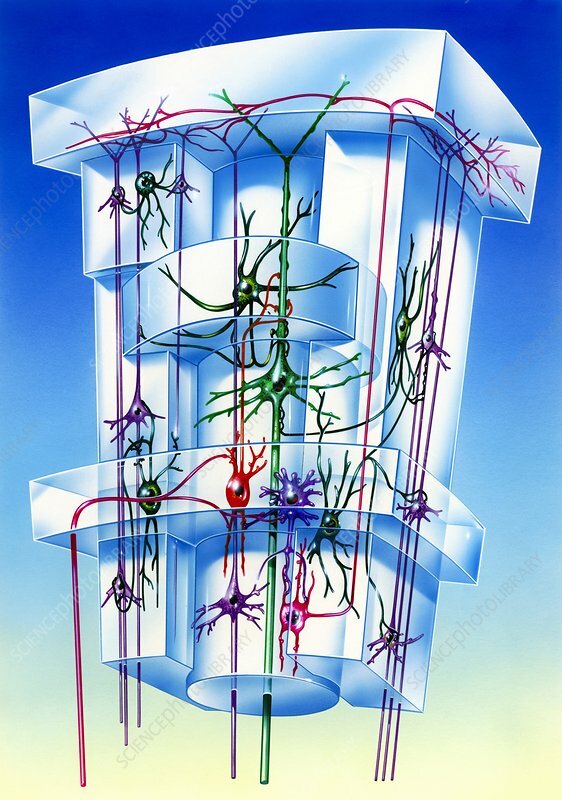 The cells include neurons (nerve cells), glial cells (connective tissue support cells). The neurons include pyramidal neurons and stellate neurons. There are six distinct layers in the cortex, comprising microcircuits grouped into the columns and blocks shown here. The human cerebral cortex is 2 to 4 millimetres thick.